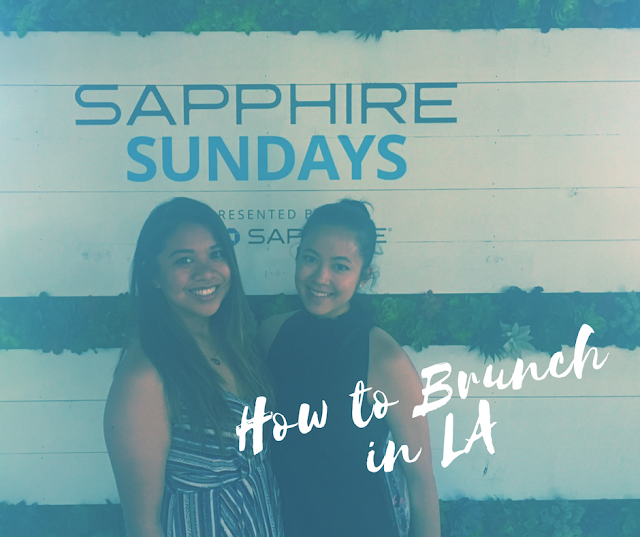 The Chase Sapphire Sunday event at Rose Cafe in Venice was a true experience in brunch in the time of influencers. It's an event reserved for Chase Sapphire cardholders or some lucky "influencers." When we arrived, we were greeted by people holding their phones up, trying to capture the ambience, the flower arrangements, and the photogenic pastry spread. 1. It doesn't matter if pastries are dry, as long as they are arranged on different trays and photograph well. 2. Collections of plants make perfect backdrops for cocktails. 3. Don't be ashamed do ask people to borrow their table for your perfect shot. 5. Live by the mantra "another day, another avocado toast." 6. There is no shame in asking a waitress to pose with a tray of avocado toast. 7. 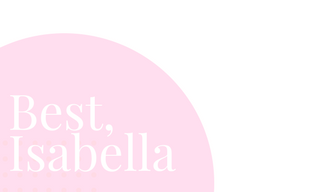 Wear ultra high heels to brunch so you don't have to embarrassingly stand on a chair to take a good flat-lay. 8. Put unphotogenic (but delicious) food, food that you already started eating, or used napkins on a chair so as not to pollute your shot. 9. Move everything to one side of a table so other people who aren't participating in the food photoshoot can still eat their food in peace. Also order a full tray of avocado toast (even though you won't eat it) to add different elements into your instagram. 10. 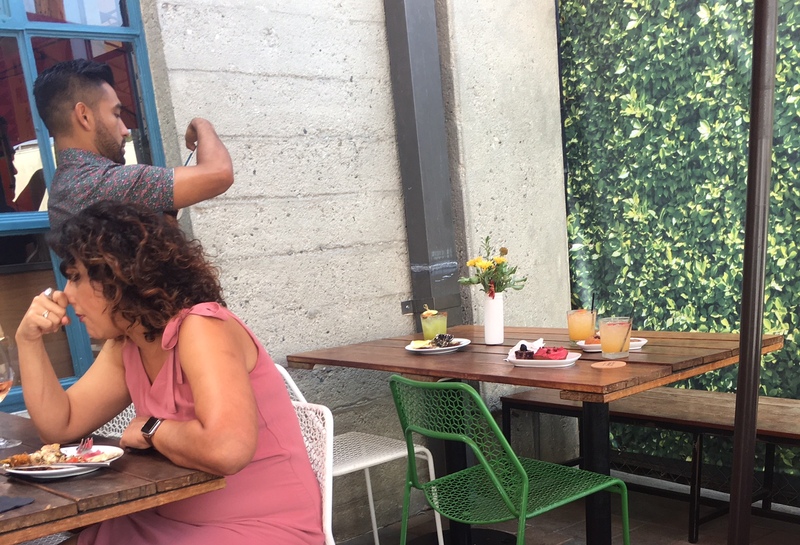 If you aren't going to get a photo with Chrissy Teigen, make sure your food photos make up for it. Chrissy was behind a curtain when we got there, not taking pics with anyone, and her bodyguard wouldn't even let me take pics of the back of her head through the see-through curtain. You cannot believe how upset these instagram girls were that they weren't going to get a photo with Chrissy. We all paid $100 for the chance to "brunch with Chrissy" and she's not even taking photos?! Melanie and I decided to just enjoy the food and sit down and also take potential instagram photos of each other. The food was great, I particularly enjoyed their neapolitan margherita pizza and the chicken banh mi sandwiches. 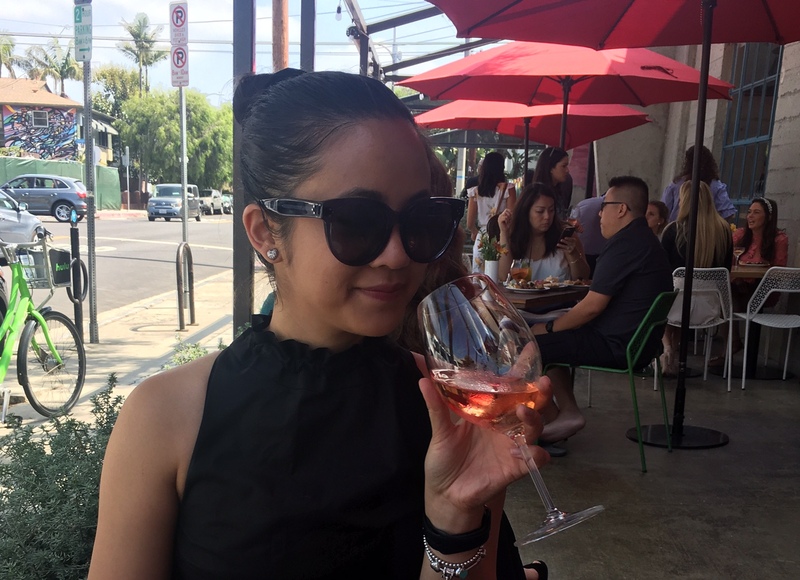 Also enjoyed the waiters lurking around waiting to give you another glass of rose. Is that what the cafe is named after? I posted a photo from this shoot on instagram, not this exact one, but one where my arm looked very skinny to the point where I looked maybe anorexic. I've gotten more likes on that photo than many others, and I think it's because everyone is so impressed that my arm looks so skinny! It's not actually that skinny though, but its fun to pretend. It's also fun to pretend that people are wondering if I really am that skinny, and whether it's photoshopped it or not. 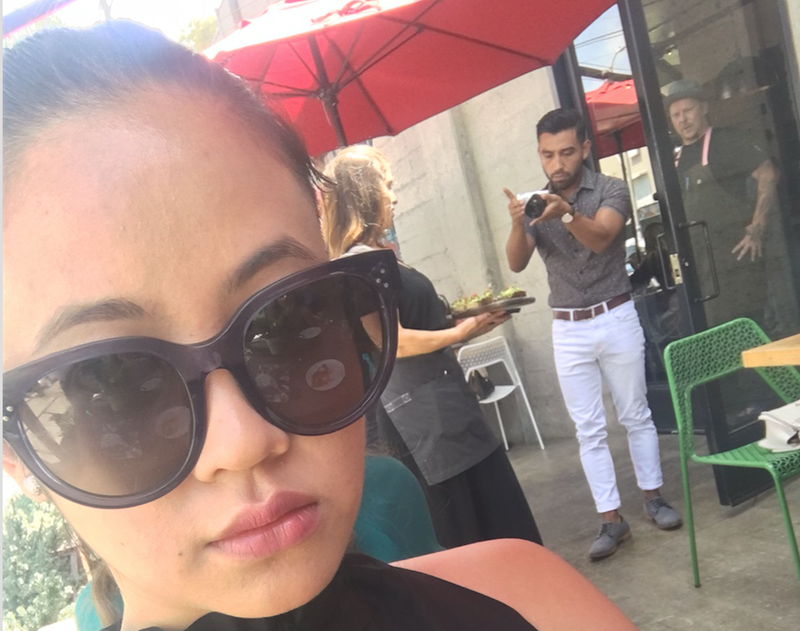 This is another tip for brunch in LA: go with someone that will take multiple pics of you while eating food and posing with food items. Luckily, Chrissy posted one snapchat of the event so I screenshot it in hopes to replicate it with Melanie on the same bench. We couldn't actually even get to the actual bench Chrissy was sitting on, as it was on the "patio" and the "patio" was only set up for "VIPs" even after Chrissy already left, so we had to make do with this other bench that is not nearly as good and is clearly not in the same place. Also Chrissy's pose is actually much harder to replicate than she makes it look. Can't underestimate models! I never posted this on instagram because I already posted two other pics from the same event. Definitely worth $100.